Papers and photos from the conference. 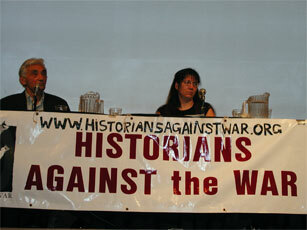 The February 17-19 Austin conference sponsored by Historians Against the War was the first scholarly conference in the U.S. to examine the origins of and opposition to the war in Iraq in historical perspective. About two hundred people attended the conference itself, while nearly a thousand additional people came just for the Friday evening plenary, featuring keynoters Howard Zinn and Andrea Smith. Three audio CDs (including Howard Zinn's keynote address) from the conference are available for $5 each.